Alias' award-winning Maya 3D animation and effects software continues to lead the industry in technological innovation and is being adopted by more and more console and computer game developers. 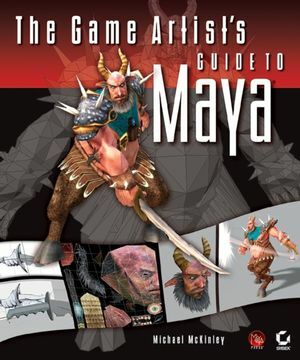 The Game Artist's Guide to Maya is an official introduction to creating 3D game art and animations with Maya, brought to you by Maya Press, a publishing partnership between Alias and Sybex. Written by a production artist at a prominent game company, this detailed book focuses on the skills real game artists use daily to create stunning characters and environments. By following the discussions and tutorials, you'll bring a concept through the entire game art development pipeline, learning everything from modeling, texturing, rigging, and animation, to special effects. You'll also glean insights from industry professionals and see how Maya has been used in popular games. If you're a 3D game artist, or looking to become one, this book will help you master the skills and techniques you'll need to excel in the competitive games industry. Michael McKinley is a 3D artist at Warthog Games in Austin, Texas. He is an online instructor at simplymaya.com as well as simplyphotoshop.com, and previously taught a Maya course at Collins College (Phoenix). Chapter 1 The Game Industry. Game Modeling Common Tools and Commands. Creating the Hilt and Grip. Tutorial: Creating the Character Model. Texturing in the Gaming World. Alpha Channel and Pixel Shader Effects. Applying a Material to a Model. Applying a Texture to a Material. Setting the Local Rotation Axis. Modify Timing in the Trax Editor.